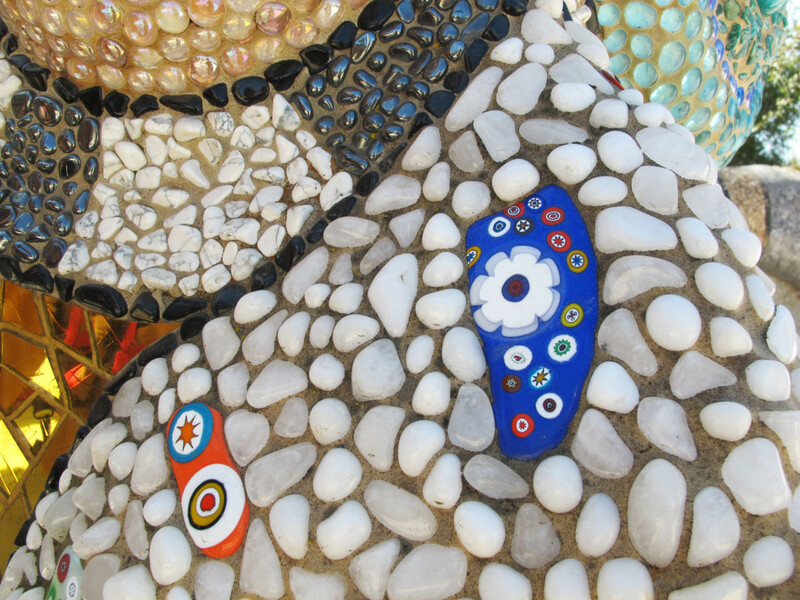 ESCONDIDO — In 2003 the city of Escondido opened Queen Califia’s Magical Circle — the only American sculpture garden created by renowned French-American artist Niki de Saint Phalle — in the Iris Sankey Arboretum in Escondido’s Kit Carson Park. It has become a cultural landmark for the San Diego region — a place where visitors can mill about while playing, touching, dreaming and finding inspiration in the garden’s colorful homage to California’s mythic and historic origins and its cultural diversity. To date there have been more than 12,600 visitors to the garden on the standard open days with an additional 482 visitors with private groups on other days, according to Visit Escondido. 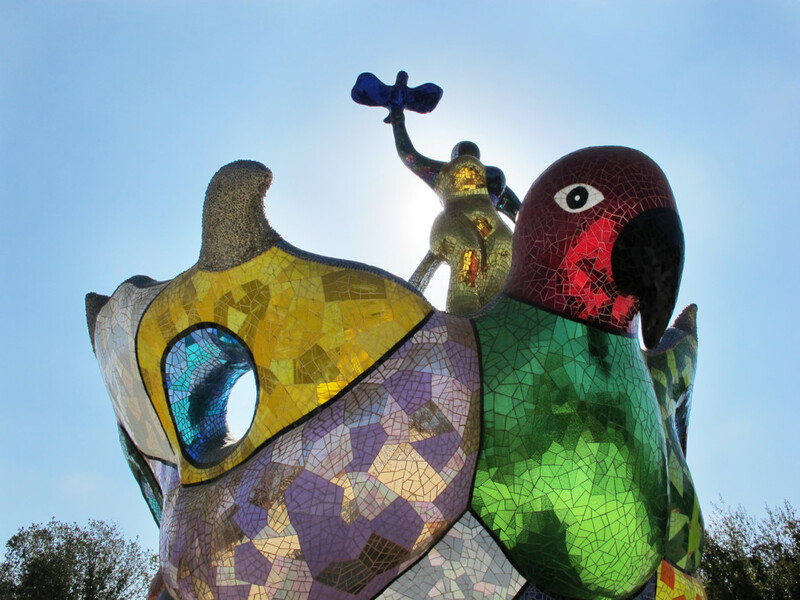 “Queen Califia’s Magical Circle is a unique and vital art installation in our community. We’re so fortunate to have Niki’s only North American sculpture garden located here to share with San Diego locals and our many national and international visitors!” said Katherine Zimmer, the city of Escondido’s tourism manager at Visit Escondido. If you’re not familiar with this artist who lived in La Jolla until her death in 2002 at age 71, she was born in 1930 in Neuilly-sur-Seine, France, and was raised in New York City. Her art is collected by everyone from well-known celebrities (musicians who perform at theSuper Bowl among them) to business people around the world. “She has always had a huge market and it’s because her art is fun, lighthearted, beautiful, colorful and just brightens up whatever environment it is put in,” said Dave Stevenson, her former business manager, who brokered many art deals for her art. Saint Phalle started painting in 1948, moved four years later to Europe (Nice, Paris and Mallorca) and first came to international prominence in 1961 as a member of the influential “New Realists,”a group that also included Christo, Yves Klein and Jean Tinguely (her frequent collaborator whom she married in 1971). She is best known for her oversized, voluptuous female figures, the Nanas, which can be seen in cities and museums around the world. Among her large-scale installations are the “Stravinsky Fountain” near the Centre Pompidou in Paris (1983), the “Tarot Garden”at Garavicchio in southern Tuscany (which was entirely financed by the artist and opened after24 years of work in 1998), and the “Grotto”in Hannover’s Royal Herrenhausen Garden (2003). Saint Phalle continued living near Paris until 1994 when, because of poor health (brought about by exposure to toxic fumes from polyester materials used in her early sculptures), she moved to La Jolla, said Stevenson, who is also a trustee for her estate. “She is very well-known in Paris and among those in the art world,” he said. 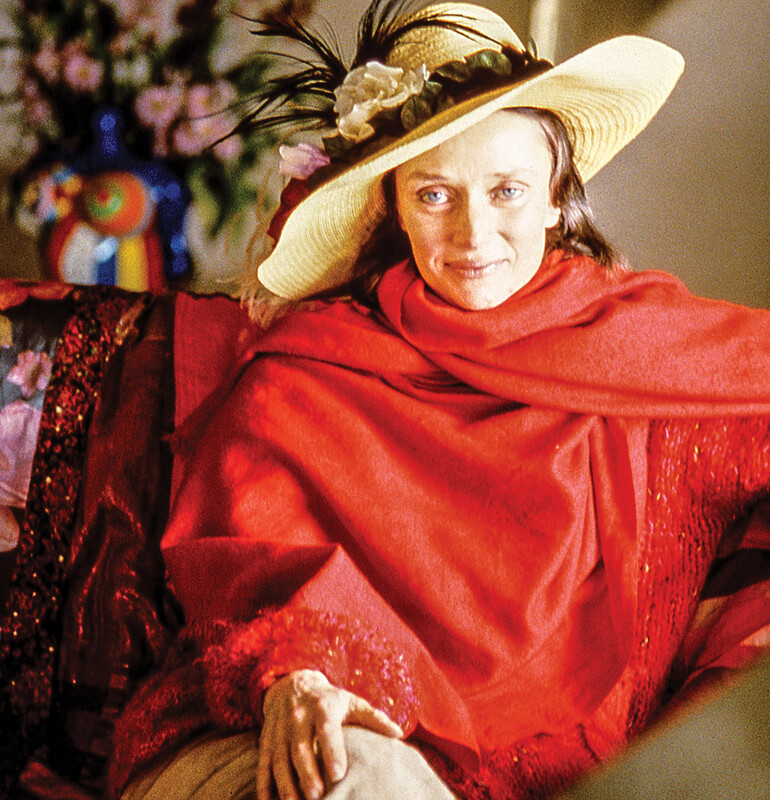 “Niki was a very charismatic woman and she moved to La Jolla for health reasons, and to escape her notoriety. She was constantly harassed by the media and couldn’t go anywhere without being noticed in France. She loved La Jolla and in California she was anonymous, and she could just do her art. 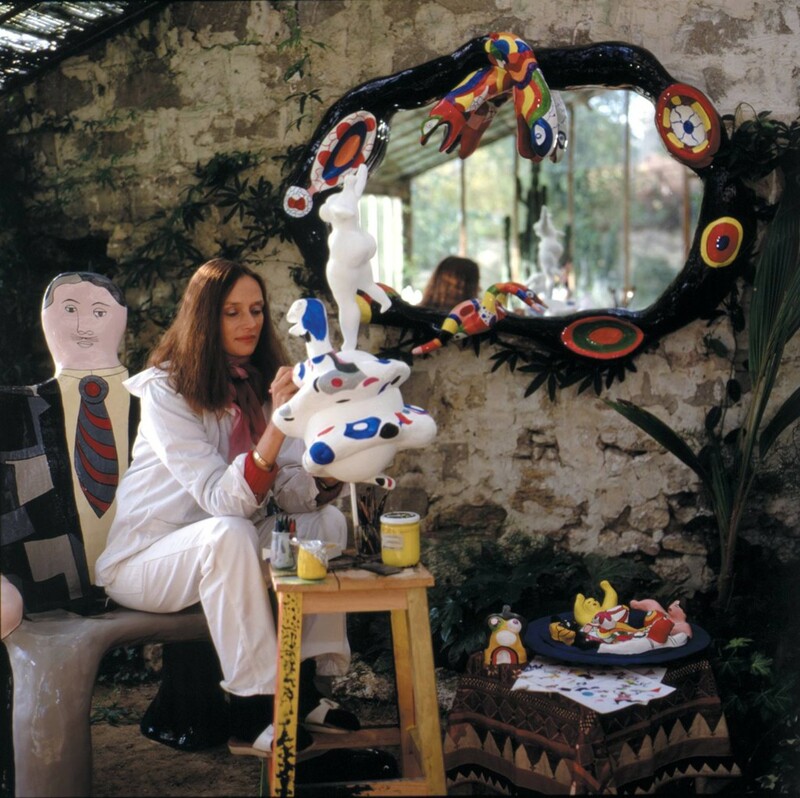 She also had a severe lung disease due to working with fiberglass throughout her art career. “Her sculptures were made of polyester and she damaged and compromised her lungs during the later course of her life,” he said. She was also a force to be reckoned with and worked until the end; especially helping to create the Queen Califia garden park. It was about two-thirds completed before she died, Stevenson said. The legend was first popularized in the16th century romance novel, “Las Sergas de Esplandián,” which received wide circulation in Spain. Geologist John McPhee recounts the tale in his book “Assembling California” (1994), which Saint Phalle read and drew on as a source for her initial ideas. It took nearly four years to plan and execute and Saint Phalle remained a part of the project until just before her death. The results are magical and ever changing, as the movement of light, wind, color and reflections continually transform the garden. “Her art is just great fun to look at when you want to take a break and let your mind wander off,” said Stevenson, who has a Saint Phalle race car she created just for him. The park’s entrance is five minutes from the Via Rancho Parkway exit off I-15 at the intersection of Bear Valley Parkway and Mary Lane; then follow signs to parking. Admission is free. For general information, call (760) 839-4691 or go to www.queencalifia.org. Unfortunately many of the facts here are wrong. Dave Stevenson was Niki’s accountant starting in around 1996- he was never a business manager who got her deals. He negotiated some of Niki’s prices with her clients. He is also a trustee of her “charitable” art foundation- not estate. Unfortunately, Dave and the other trustees are not adhering to Niki’s will and instead run the charity for personal gain. Niki’s offshore accounts as well in Europe – ones I don’t believe Dave declared as he should have also seemed to have disappeared. Managing in this context takes on whole new meanings. DA’s of California and Utah should perform forensic accounting of the foundations accounts. Niki’s will called for the cessation of sales of her art and donation of excess income to go to children’s art programs. NIki wanted her collection ideally kept whole and donated to a museum or other public institution like a university. None of this has been done and foundation geared toward selling Niki’s art. Dave and other trustees run the foundation like a tax free business for their own enrichment.